Aviation Updates Philippines - Kuala Lumpur-based low-cost carrier AirAsia Berhad is dropping flights between Kuala Lumpur and Kalibo on March 24, 2018, nearly four years after the inauguration. The four-times-a-week service is being flown every Mondays, Tuesdays, Thursdays, and Saturdays on-board an Airbus A320-200 aircraft. 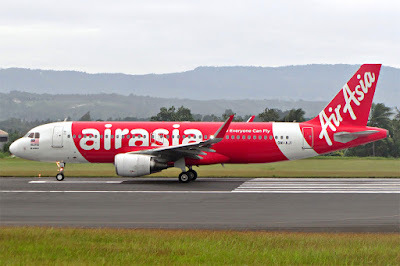 According to information provided by AirlineRoute.net, AirAsia is also dropping services to Solo on January 13, 2018, and Surat Thani on February 25, 2018. The Fernandes-led airline launched direct services to Kalibo on April 18, 2014. Flights were expected to bring more tourists to Boracay's gateway. Kalibo is the airline's third destination in the Philippines. Recently, AirAsia inaugurated services between Kuala Lumpur and Davao on December 21, 2017. The inaugural flight was fully booked, approximately carrying 180 passengers on a single leg. Flights are flown four times weekly every Sundays, Mondays, Tuesdays, and Thursdays.